ExoticA is hosted with Mythic-Beasts who are kindly sponsoring the bandwidth needed for the site. They offer an excellent Mac Mini dedicated hosting service which is ideal for a low cost hosting solution. 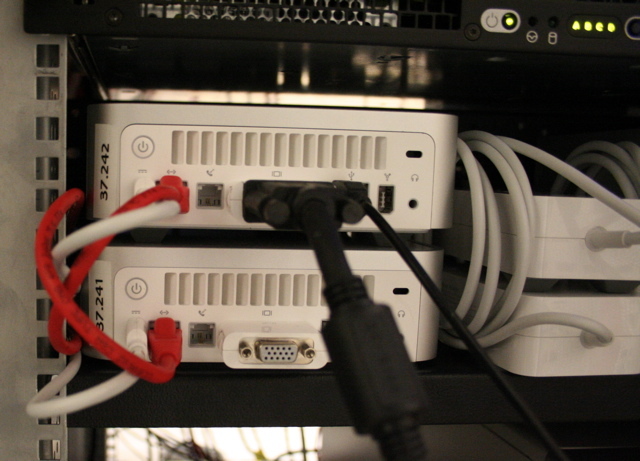 The Mac mini is very small, so you can fit 8 in 3U of rackspace, but also they don't require a great deal of power. For more details please visit the Mythic-Beasts Mac Mini page. The server name is Malus, which is the genus for Apple :-) It also means evil in latin, but you can't have everything. And to finish with we have to have some pictures of the actual server. Malus is on the bottom left.